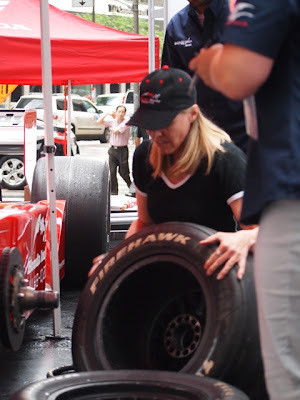 Nika and I had a blast yesterday at a fundraiser for Make-A-Wish Canada with the Honda Indy. Ten duos representing various media outlets competed, and while we didn't win, we didn't lose! Nika is awesome at this. Her site, racerchicks.com, is on haitus as she's on maternity leave...her new little girl is gorgeous! She's been involved in racing and rallying and cars forever, and I was lucky to have her as my partner. Next year, we're gonna practice at her place first. And smoke the competition. Really. I'm not going to care at all about my nails. Not a bit. Tomorrow is Free Friday at the Indy. Head on down for free entry with any donation to Make-A-Wish Canada. Sweet deal. Here's Nika, showing how it's really done. Most girls I hang out with don't want to be known as "the flat girl." But I guess we all have our little foibles. Although I suppose most guys I know don't want to be known as "the 21 second guy" either. We'll just call it a tie. A tip of the hat to you both for this - especially for working with Make A Wish Canada. I was down at the Indy all three days. On the Friday afternoon, I thought I recognized one of the blue t-shirted Make A Wish Canada volunteers - it was Jennfier Ritter, the organization's President, helping out her team of volunteers collecting donations and handing out tins of Dr. Pepper! Love ice cold Dr. P. warm, been baking in the sun for an hour or two Dr Pepper - not so much. Jennifer is terrific. And every one was on hand on Friday for the thing Nika and I did. I totally slowed Nika down - but hey, wait'll next year! 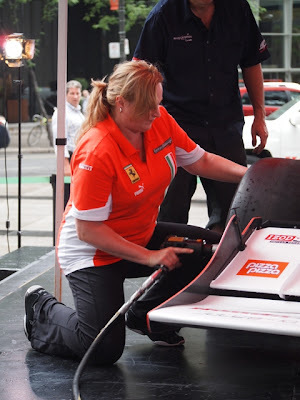 An update for everyone: Racing fans help Honda Canada raise $75,000+ for Make-A-Wish Canada through fundraising initiatives at Honda Indy Toronto! Last year at the Toronto event, $50,000 was raised and $112,000 between Toronto and Edmonton. Way to go everyone who did their part to support this worthwhile programme.